Cable stripper Manufactured by Piergiacomi Italy Model SC1/S and SC2/S, soft grip, SC1/S : for cables with Ø between 4 and 16mm with adjustable internal blade and SC2/S : for cables with Ø between 8 and 28mm with adjustable internal blade. 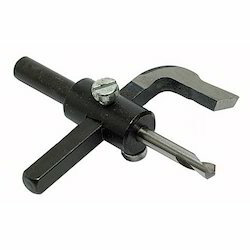 Adjustable Quick Cutter Hole Saw 2-1/2″ to 7″. This tool adjust from 2-1/2″ to 7″, fits the 3/8″ drill chuck, can be used with cordless drills, has carbide coated self-sharpening cutting blades, and comes with 2 flexible Dust Shield. This machine is most suitable for cutting Ply, Wooden Board, Plastic Laminates, etc. avaiable in 3'x 2' , 4' x 2' & user defined table sizes are also produced. Can be Swiveled to cut levels up to 45 with an instrument of forturte by stretching and pinion. 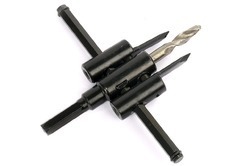 We are engaged in manufacturing a wide range of adjustable cutters. Our products are manufactured from supreme materials.